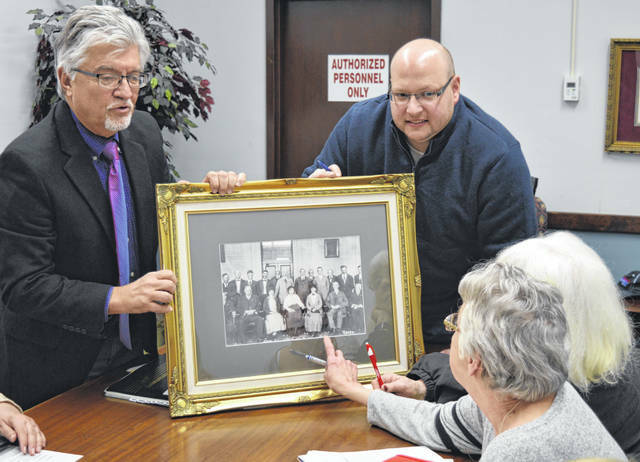 Clinton County Common Pleas Judge John W. “Tim” Rudduck, left, shows other members of the 100th Anniversary Committee a re-conditioned photo that’s believed to show the first women jurors in the history of the county. Clockwise from Rudduck are Jeff Walls, Jennifer Hollon and Kay Fisher. WILMINGTON — The date has been selected plus all four local school districts are on board to provide choirs for the 100-year anniversary celebration of the Clinton County Courthouse. The centennial event will be held on Saturday, Oct. 19 with the exact times to be announced later this year when the day’s schedule is set. Wilmington schools’ vocal music teacher David Beck “has graciously agreed to coordinate” the countywide concert, said Clinton County Commissioner Brenda K. Woods, who is the 100th Anniversary Committee chairperson. Preliminary plans for the concert call for presenting songs from the time period circa 1919. Each school will sing maybe one or two selections, and the countywide choir will perform two or three songs. A book telling the history of all three courthouses the county has had is planned. Indeed, it is currently getting proof read, said Clinton County History Center Director Kay Fisher. A recently retired attorney from Clinton County wants to be involved, and has brought up the possibility of a mock trial. Refreshments, of course, will be part of the event’s lineup. Ron Rudduck, a brother of current Clinton County Common Pleas Judge John W. “Tim” Rudduck, hopes to do postcards. Progress has been made on ordering 100 amber glass keepsakes that bear an image of the courthouse. They would be sold at the Clinton County History Center, said Fisher, and cost maybe $12 or so. The committee is still open to hearing about old or current courthouse photographs, artifacts and memorabilia that residents possess and are willing to loan and to have displayed for the occasion. Woods can be contacted via the commissioners office at 937-382-2103 or on her mobile phone at 937-302-6800. At the committee’s planning session Thursday, Judge Rudduck retrieved a framed photograph believed to show the first women jurors in the county’s history. All beat up when previously obtained, the photograph has been re-conditioned, he said. “Those [first three women jurors] were a stern-looking bunch. They were going to take that job seriously,” remarked Rudduck. Also planned, as reported earlier, is an unveiling of an historical marker on courthouse square. Guided tours of the courthouse, known for its stately architecture and artistic rotunda, are anticipated. The tours may be led by people in period costumes. At the first planning meeting in November 2018, committee member Jennifer Hollon suggested placing colorful flag bunting on the exterior of the courthouse to mark its centennial. The News Journal has agreed to publish a series of articles and photographs leading up to the October anniversary. They would highlight the various departments within Clinton County government, with photos of current staff.